본 연구는『林園經濟志』「遊藝志」에 수록된 射訣을 실제 수련을 바탕으로 한 몸 문화의 관점에서 분석하여 18세기 활쏘기 수련방식과 그 무예사적 의미를 살펴보았다. 또한『射法秘傳攻瑕』와 『조선의 궁술』중 射法要訣에 해당하는 부분을 서로 비교하여 전통 활쏘기의 보편적 특성을 살펴보았다.『임원경제지』의 저자인 서유구는 대표적인 京華世族으로 家學으로 전해진 농업에 대한 관심을 통해 향촌생활에 필요한 여러 가지 일들을 어릴 적부터 접할 수 있었다. 또한 관직에 오른 후에는 순창군수를 비롯한 향촌사회의 일을 직접 살필 수 있는 관력이 있었는가 하면, 閣臣으로 있을 때에는 수많은 서적들을 규장각이라는 거대한 지식집합소를 관리했기에 백과사전적 공부를 진행할 수 있었다. 그리고『鄕禮合編』등 다양한 서적들의 편찬을 담당하면서 의례를 비롯한 전통지식을 물론이고, 청나라에서 수입한 새로운 實學書들을 정리하는 과정에서 지식의 체계적인 관리와 정보의 중요성을 인식하여『임원경제지』를 저술하게 되었다.『임원경제지』중 사결에는 당대 활쏘기의 수련방식과 활과 화살을 제조하는 것에 이르기까지 활쏘기와 관련한 다양한 정보를 수록하고 있다. 특히 서유구 자신이 활쏘기를 젊을 때부터 익혔고, 활쏘기 역시 家學으로 여겨질 만큼 집안의 거의 모든 사내들이 익혔기에 보다 실용적인 부분을 중심으로 체계화시킬 수 있었다. 이러한 사결의 내용 중 실제 활쏘기 수련시 나타나는 다양한 몸문화적인 측면을 요즘의 활쏘기와 비교 분석하며 정리하였다. 이를 통해 『임원경제지』의 사결에 실린 활쏘기의 모습이 당대의 몸문화를 가장 잘 반영하고 있음을 확인할 수 있었다. In this research, we observed archery training methods in the 18th century and it's military artistic meaning from somatic cultural perspective by reviewing Sagyul(射訣, instructional description on archery collected in 『ImwonGyeongjeji』(林圓經濟志, encyclopedia written by Seo Yu-gu) 「Yuyeji」(遊藝志, arts and crafts of gentry class). In addition, this study recognized universal characteristics of Korean traditional archery by examining related contents including Sabupbijeon-gongha(『射法秘傳功瑕』, book on archery published by Pyongyang-Gamyeong in late Joseon dynasty) and Sabup-yo-gyul(射法要訣, condensed archery manual) collected in 『Archery of Joseon』, which is an instructional book on archery written in 20th century. Seo Yu-gu, the writer of 『ImwonGyeongjeji』, was a representative Kyung Hwa Sa Gok(京華士族, privilege rank that monopolized a honor and an official post in the 18th in Korean governing class). Affected by agricultural academic tradition of his family, he was able to experience variety of things necessary to rural environment. Furthermore, after filling the office, he had an authority to take care rural society directly including Sunchang District Governor. When he worked in Gyujanggak(奎章閣, royal library built in late Joseon dynasty), he even arranged encyclopedic research as he managed all the databases collected in the library. 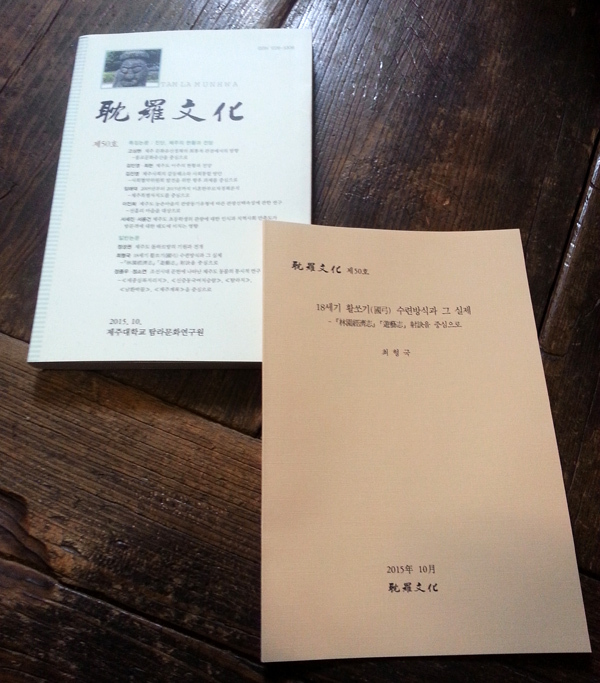 In the process of handling various book publication including ritual book such as『Hyangryehap-pyun』(鄕禮合編, integrated book on rural ritual) and arranging new practical science books imported from Qing dynasty, he felt necessity of systematic management of knowledge and information and its outcome was『ImwonGyeongjeji』. In Sagyul, there are different kinds of information on archery from training types to manufacturing methods of bow and arrows. Especially, he organized it by putting more stress on practicality as Seo Yu-gu himself trained archery since childhood and almost every men in his family mastered it in their life. According to this, various somatic cultural aspects that appeared in Sagyul were examined by comparing current archery.